Before I get on with the reviews this week, just a few words on my LOVEFiLM lists. Much like God, the lists work in mysterious ways. Having thoroughly enjoyed Fast Times at Ridgemont High last week, I recently added a couple of teen flicks (Clueless and Some Kind of Wonderful) onto the 'high priority' section of my account, and the films almost immediately arrived through the door, meaning that three of the last five films I've received have been in that genre. I'm not sure if there is any particular order to the films which are sent out, or why certain 'high priority' films remain unsent for years while others are sent out straight away. Unless I'm able to go undercover and infiltrate the secretive Peterborough based headquarters of LOVEFiLM, I suspect I will never find out. Bill Paxton's directorial debut is a killer on the loose yarn set in the wilds of Texas; in the present day, a man calling himself Fenton Meiks (Matthew McConnaughey) enters FBI headquarters and tells the agent in charge (Powers Boothe) that he is the brother of the notorious 'God's Hand' serial murderer. As Meiks tells his story, the film flicks back and forth between his childhood in smalltown Texas in the 1970s and the present day, as the initially sceptical FBI man is increasingly drawn in by Meiks' tale. 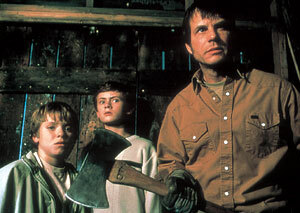 Back in the '70s, Meiks' father (Paxton) announced to his two sons that he had been visited by an angel who demanded that he rid the world of a number of demons on Earth. Meiks fears that his brother has been continuing his father's work in the present day. This is the type of movie which focusses more on the killer himself than the men trying to catch him. For the first hour or so, I liked the film, though it was the kind of story which I've seen told on several occasions as MOTW episodes of the X-Files, as well as various episodes of Millennium. Unfortunately, I felt a little let down by the twist ending, which takes things in a implausible direction. Still, Paxton does a good job at building atmosphere and suspense for most of the film, and it certainly isn't a disaster, by any stretch of the imagination. I'd never seen this quintessentially '90s movie, but having enjoyed director Amy Heckerling's work on Fast Times at Ridgemont High, I decided it was high time I gave it a go. 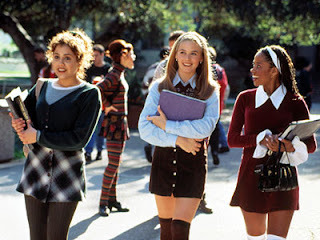 The plot of the film is based on Jane Austen's classic novel Emma, but the action is transplanted into the soulless, plastic heart of a 1990s Beverley Hills high school. Alicia Silverstone plays high school queen bee Cher Horowitz, a pretty vacant (but generally kind hearted) girl who decides to play matchmaker for her classmates and teachers. I'm a little unsure how I feel about this movie - on the one hand, for all that the film appears to wish to satrise the lives of fabulously well to do Californian teenagers, it also feels to some extent like a celebration of the airheaded consumerist culture that Cher and her friends represent. I much preferred the savage treatment which Heathers (in my view, the all time champ of teen movies) dished out to similar characters. I also found it a little unsettling that Cher ended up getting together with her former stepbrother. On the other hand, the film did have its moments. Despite, like, a surfeit of irritating '90s slang or whatever, the script is very funny in places ( I particularly liked Cher's father's comment to a prospective suitor: "Anything happens to my daughter, I got a .45 and a shovel, I doubt anybody would miss you.") Silverstone is very sweet in the title role, and it's difficult to wish the same end for her as that suffered by Heather McNamara. She's also well supported by a number of familiar faces, including Paul Rudd, Brittany Murphy, Donald Faison and Wallace Shawn. On balance, then, fair to middling. Tomas Alfredsson follows up his excellent 2008 vampire movie, Let The Right One In, with this engrossing spy thriller, based on John Le Carre's novel. The film features an all star cast of top notch British and Irish acting talent - Gary Oldman, Colin Firth, Benedict Cumberbatch, Stephen Graham, Ciarin Hinds, John Hurt, Tom Hardy... it's hard to believe that so many great actors signed on to appear in the same movie, but I guess with the end of the Harry Potter series, British actors need to look elsewhere for parts in big productions. The film is a rather different pace to the type of Bond or Bourne spy thriller which is most common at the cinema - it deals with the grey, bureaucratic inner workings of MI6 (described throughout the movie as 'The Circus'), rather than chases and shoot outs in exotic locales. 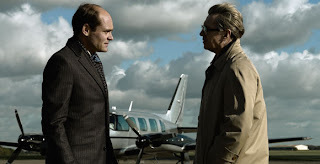 The plot centres on the efforts of George Smiley (Oldman), as he attempts to identify a Soviet mole who has infiltrated the top echelons of the British secret service. This follows a disastrous mission in Budapest, where a British agent (Mark Strong) was shot in the back and Smiley and his boss were forced to retire. Now, however, Smiley is back, and he is forced to use all of this cunning to track down the double agent in his own ranks. This is the kind of film where you have to pay full attention the entire time - there are no exposition heavy conversations - all of the characters, as spies, are constantly hiding something from one another, and when they speak they are terse, hesitant to give away anything which might compromise their own position. The movie is shot in desaturated colours, in the drab and grey Britain of the '70s; this lack of colour is reflected in the characters - you feel that George Smiley has been a spy for so long that he feels little joy in anything anymore, even when he is finally able to root out the mole. A very well made film, with strong performances from the ensemble cast, TTSS is well worth seeking out. Maybe it's teen movie fatigue setting in, but I was utterly unmoved by this one. It was just all so predictable - I felt as though I knew exactly what would happen at the conclusion about a third of the way through the movie, and as it transpired, most of my predictions were spot on. Eric Stoltz plays arty high schooler Keith Nelson, whose only friend is tomboy drum enthusiast played by Mary Stuart Masterson. 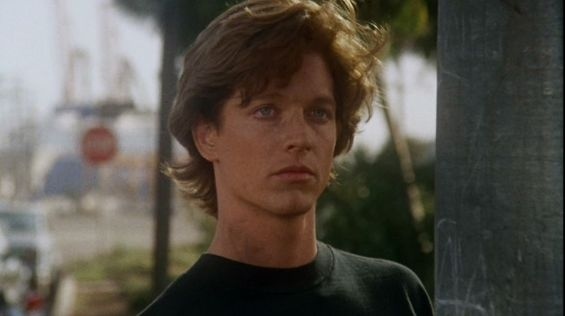 Despite it being obvious that his best friend has the hots for him, Stoltz pursues the class beauty, played by Lea Thompson - who is currently in a relationship with some sort of '80s yuppie Don Johnson wannabe. Will Stoltz realise that his true feelings are for his best friend, rather than some idealised dream girl? Will the gang of tough kids he conveniently befriends in detention come to his aid in a face off with his love rival? It isn't hard to work out what's going to happen. The predictability of the plot wouldn't be so bad if you cared about the characters, but it's difficult to feel much interest in the fates of Stoltz, Masterson and Thompson who spend most of the time whining about how awful their lives are, and are only symnpathetic in comparison with the evil yuppie currently dating Thompson. The film's soundtrack is also really bad - full of crappy '80s synth pop rock (sorry to keep harking back to Fast Times at Ridgemont High, but that movie had a really good soundtrack; see also Say Anything and Adventureland). As a sidenote: Lea Thompson looked much better in the '50s get up she wore in Back To The Future than with the '80s feather cut she sports in this movie. Of the John Hughes movies I've seen, this one would have to come bottom of the list. And one more (probably Boogie Nights or The Secret In Their Eyes, depending on my choice of film tonight).